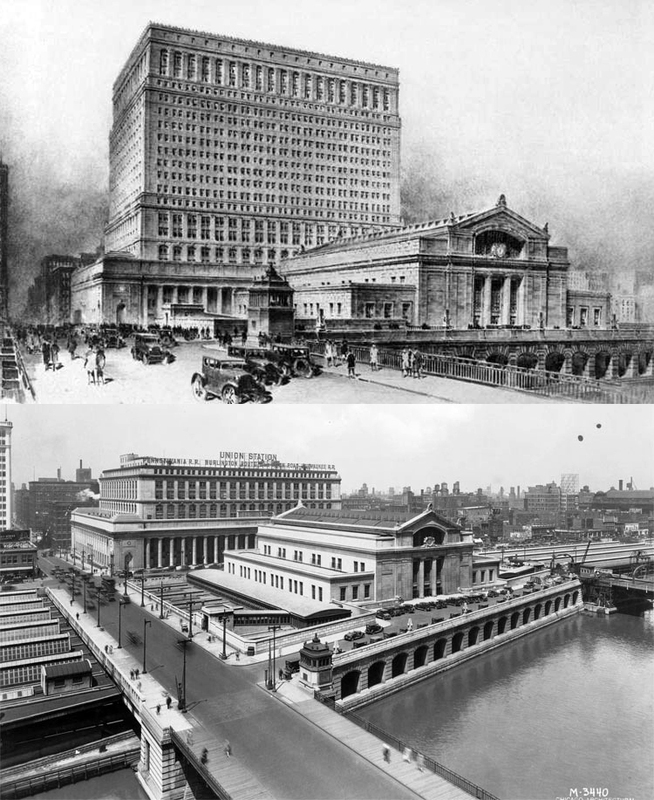 The year 1914 will see some of the greatest developments in railway terminals in the history of Chicago. More than $50,000,000 will be expended in this class of work done. The figures include the cost of terminals completed, those under construction, ands on which work has started. The bulk of this tremendous expenditure will be for the new West Side depot and terminal to take the place of the old Union station. On this improvement alone $65,000,000 will be expended. On the extension of its terminal and factory site improvements the Chicago Belt railway will spend not less than $10,000,000. Added to this must be perhaps an equal amount which will go into factories and wholesale houses that are taking advantage of the Belt line facilities to locate along its terminals in the outgoing sections of the city. Next in importance is the new Soo Line freight terminal at Twelfth and Canal streets., This improvement has cost the company, for the site and buildings and trackage, in the neighborhood of $8,000,000. On the passenger terminal alone $40,000,000 will be expended. The remaining $25,000,000 will be used in the freight terminals of the four roads. The ordinances under which these improvements will be made were passed by the city council last March and forecast the largest single development in Chicago and its vicinity since the steel corporation built the town of Gary. The new passenger station, which is to form the center of the terminal, will be located in the block bounded by Adams, Canal, Jackson and Clinton streets. A large subway, the full length of the block, will connect the passenger station with the train concourse east of Canal street. From this ten tracks will run to the north and sixteen to the south. The Pennsylvania freight house will be located immediately north of Twelfth street and extend to Taylor street and east of Canal street. The Burlington freight house will be placed between Harrison and Harrison and Taylor streets and near Canal. The executive offices of the Burlington already have been located in the new building in the district. The magnitude of the improvements to be made can be seen from the following summary of the ordinances under which they will be carried out. The straightening of the river. The construction of a connection between Canal street and Orleans streets, connecting the north side and west side iof the city. The widening of Canal streets, from 80 to 100 feet from Washington street to Twelfth street. The grading of Canal street to be as uniform and level as practicable. The opening of Monroe street as a through street. This includes bridge and viaduct approaches. The present and future widening of all east and west viaducts from Lake street to Twelfth street, inclusive. The building of the Twelfth street viaduct 113 feet wide. The provision for the viaduct on Congress street across the tracks whenever the city opens that street from Franklin street to the river. The keeping of the level of the viaduct roadways down to the level of the river bridges. The opening of the Fourteenth street as an east and west street. The opening of the Sixteenth street as an east and west street. The widening of the viaduct on Eighteenth street. The widening of the viaduct from 40 to 50 feet on Polk street. The providing of space on the four sides of the headhouse for the loading and unloading of passengers without encroaching upon the present street areas. Preparations for the beginning the actual work of construction are going on, and according to architects, Graham, Burnham & Co., a start will be made in the near future. It us estimated that the work will employ 10,000 men for more than three years. 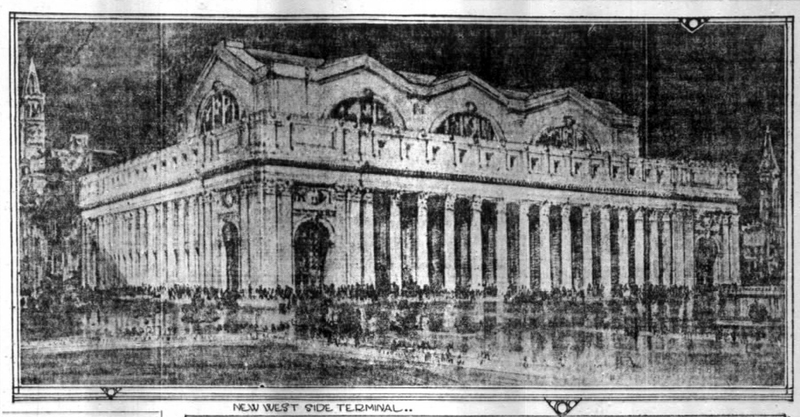 Concept drawing of the new West Side Terminal. Steam Shovels m Operation South of Harrison and Polk Streets: City Will Start Soon. First steps toward actual beginning of work on Chicago’s new $65,000,000 Union depot were take yesterday when dirt was turned on the proposed site of the new Pennsylvania freight terminals along the river south of folk street. Harrison. Only a few expert men of the shovel crews are employed. No more will be put to work on the freight terminals for some time. The dirt excavated is hauled on flat cars to the railway company’s track elevation work near Sixty-ninth and Leavitt streets. Picture taken yesterday shows first actual work for the construction of the new $65,000,000 Union Depot. Men are seen laying temporary tracks in the railroad yards along the river south of Polk street for cars to carry away dirt turned up m the site of the Pennsylvania freight terminal. Two steam shovels were put in operation and these crews will be supplemented in a fortnight by big gangs for the construction of sewers and intercepting mains in Harrison and Washington streets. Within a month several thousand men will be put at work by the city on the site of the depot proper and work on streets and viaducts. The next work in the plans for the Union depot will be the construction of sewers and intercepting mains. The Department of Public Works obtained from the Sanitary District yesterday easement for the construction of a sewer to empty into the river south of Washington street. This will be one of the main sewer outlets near the site of the station. The other will be at Harrison street. Plans for this sewer arrangement with intercepting mains have been completed in the last few days at conferences between Thomas Rodd. chief engineer of the Union Station Company; John Ericson, city engineer, and H. E. Baker, assistant city engineer. “Outside its sewer construction the City has about §6,000.000 in work on streets and viaducts to prepare for the Union depot,” said John F. Wallace, chairman of the Chicago Railways Terminals Commission. “Though the city will do this work it will be reimbursed by the railways. The building and trackage of the present Union station cover eight acres; those of the new will cover twenty-five. I have not been definitely informed when this street work will start, but ii will be soon; possibly within thirty days. It should give employment to several thousand men. 1.—Train shed and suburban station. 2.—Union passenger station. 3.—Postoffice. Under direction of the Pennsylvania railroad and the Association of Commerce, D. H. Burnham & Co. have prepared new drawings and maps of the proposed west side improvements, including the new Union Station, the new postoffice, and street and river bank improvements. The foreground of the drawing shows the east bank of the river with the subway station in the center, at the front of Quincy street. Just beyond is the improved south branch of the river, spanned by the widened, artistic bridges at Jackson boulevard and Adams street. Across the river is the improved embankment and just beyond that the subsurface train sheds (1). These will occupy the site of the present Union Station. West of Canal street is the main terminal (2), running through to Clinton street and from Jackson to Adams. Still farther west is the proposed new postoffice building (3), which extends as far west as Jefferson street. Beyond is the idealistic sketch of a possible city parkway (3), running out to Halsted street where a tower is advocated. This part simply represents a transfer of the similar plan originally intended as a continuation of Congress street. This is shifted in the plan and Quincy street becomes the axle. Railway Age, July 4, 1925. 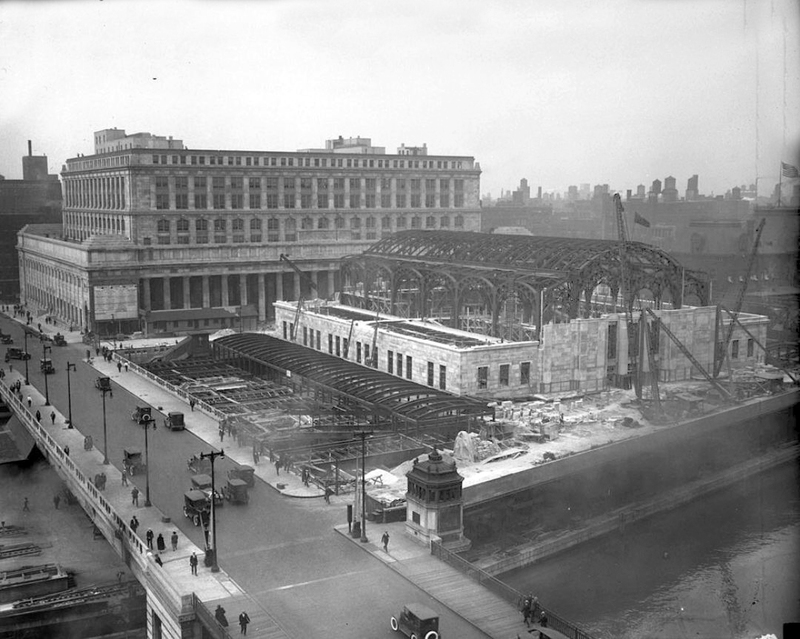 The opening of the Chicago Union Station on May 15 marked the successful completion of a $75,000,000 project which had its inception nearly 15 years ago. It represents the replacement of a passenger terminal, which had long- served inadequately to meet the demands imposed on it by a new plant of greatly increasesd capacity embodying. the latest developments in multIfanous facilities which must be provided to meet the heavy requirements of a rail gateway in a large city. The importance of this station is definitely established by the fact that it serves as a terminal for four railroads in one of the world’s largest cities. In point of number of station tracks it ranks fifth in the United States. From the standpoint of design it embodies much that is both novel and forward looking. It is the only double stub station in America, having two separate grids of platform tracks. It is the only station of first magnitude in which baggage and passengers are handling entirely on separate platforms, an arrangement which made it possible to introduce an ingenious ramp arrangement whereby trucking between platforms and the baggage room on a lower level is accomplished without the use of elevators. It embodies the most complete station facilities for handling mail found in any railway terminal on the continent. It is one of an extremely limited number of great passenger stations in which the platforms, concourse and waiting room are on a common level. It is provided with an entirely new form of train shed. It includes a system of interior driveways and vehicle platforms that practically eliminate the use of street curb space by street vehicles in the loading and unloading of passengers, mail and baggage. It includes a combined office and station building, which provides for what will be ultimately one, of the most intensive developments of railway lands ever undertaken. But even more noteworthy than any of these distinctive features is the impression created by a study of the station as a whole and the problems which were imposed in the development of an effective terminal in the face of unusually severe obstacles. The new station is owned by the Chicago Union Station Company; incorporated in 1913, the stock of which is held in four equal blocks by the Chicago, Burlington & Quincy; the Chicago, Milwaukee & 5t. Paul; and two corporate units of the Pennsylvania system. It serves as the Chicago passenger station for these three systems and a single tenant railway, the Chicago & Alton. It supersedes. a station built in 1880 which was owned by the Pittsburgh, Ft. Wayne & Chicago (the Pennsylvania) and used by the other railroads as tenants. The old station was located on a strip of ground about 134 ft. wide adjacent to the east side of Canal street between Madison street and Van Buren street. The old station building fronted on Canal street between Adams and Monroe streets opposite the transverse axis of the station track layout which consisted primarily of through tracks connecting at either end with two approaches, one from the north and the other from the south. The Fort Wayne line of the Pennsylvania, and the Alton and the Burlington lines entered from the south over a four track line located on property formerly owned jointly by the Fort Wayne and the Alton, between Van Buren and Twenty-first street. The Burlington operated over this line as a tenant to a junction with its own line at Sixteenth street. The Panhandle line of the Pennsylvania and the St. Paul entered from the north on a two track line owned jointly by the Fort Wayne, the St. Paul and the Chicago & North Western, as far as a point on Canal street near Carroll avenue. The tracks throughout this entire station area, except for a short distance at its northerly end, were depressed, all east and west streets being carried over them on viaducts which served also as the west approaches to bridges over the Chicago river which lies just east of the station property. The station building had a Waiting room on the street level with three stairways leading down to a narrow concourse flanking the west side of the train shed. The physical layout was that of a through station but from the operating standpoint it was strictly a terminal station for all of the roads using it. However, the station tracks were all so short that long trains frequently occupied portions of the tracks both to the north and south of the axis of the station and consequently the handling of trains was much the same as in a through station. Concerted efforts were made at one time during the course of negotiations preliminary to the development of definite plans for the new project, to place the station on an entirely new site at a considerable distance from the location of the old one. 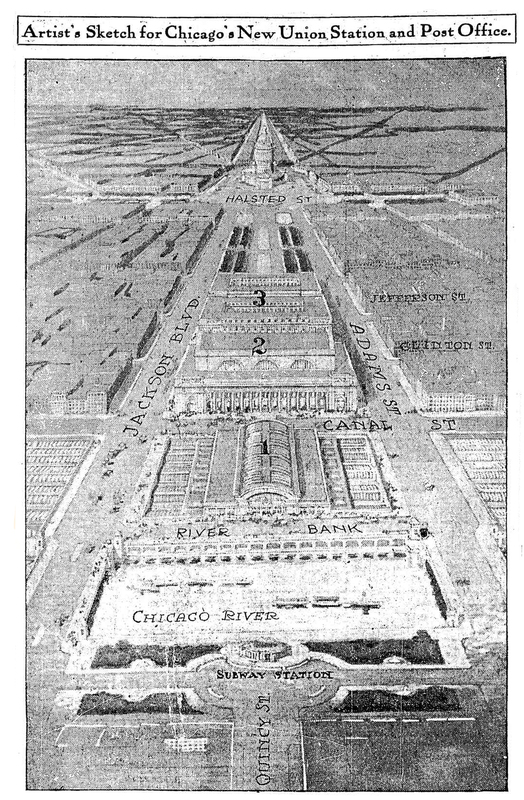 This was objectionable from the standpoint of the railways for a number of reasons, chief among which is the strategic position of the original site immediately west of Chicago’s business center and adjacent to east and west streets which constitute the main arteries of traffic between the loop district and the city’s great west side. Furthermore, any project for a change in the location of the station was confronted with one important obstacle, the fact that the station has two approaches. For, whereas the problem of the replacing of a terminal of the stub type has frequently been simplified by withdrawing to a more favorable location on the single approach, the necessity for maintaining two approaches complicated rather than simplified the problem. (5) the conduct of the construction work in and around the old station without interference with its operation. In consequence of these limiting conditions, the general track arrangement of the new station is basically the same as that of the old one, except that the layout has been enlarged sufficiently to effect q great increase in capacity and to permit of an entire elimination of the fundamental defects in the old plan. The primary requisite, that of adequate track capacity, was fulfilled by a process of expansion. 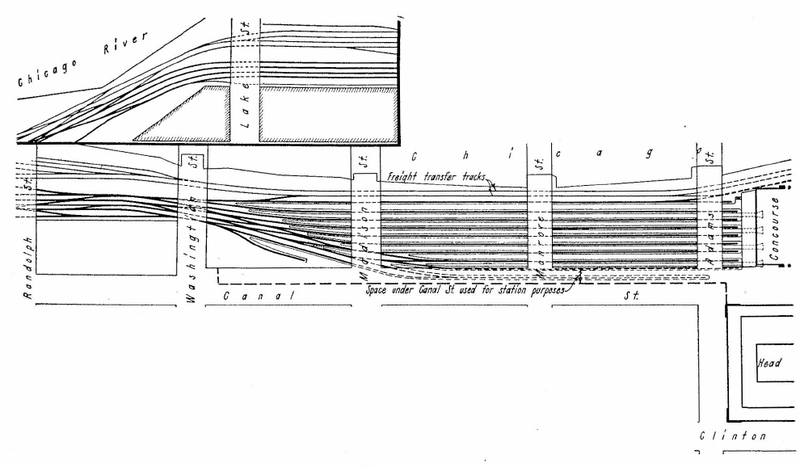 The width of the track layout was increased to occupy the entire space between the east side of Canal street and the west bank of the Chicago river, while the length was extended sufficiently to avoid the paradox of a through layout for a station that serves as a terminal for all trains entering it, that is, to provide independent station tracks for trains entering from the north and from the south with adequate capacity to accommodate the longest trains and still leave room between the ends of these two groups of platform tracks to provide ample facilities for the dispatching of passengers and baggage to and irom trains. 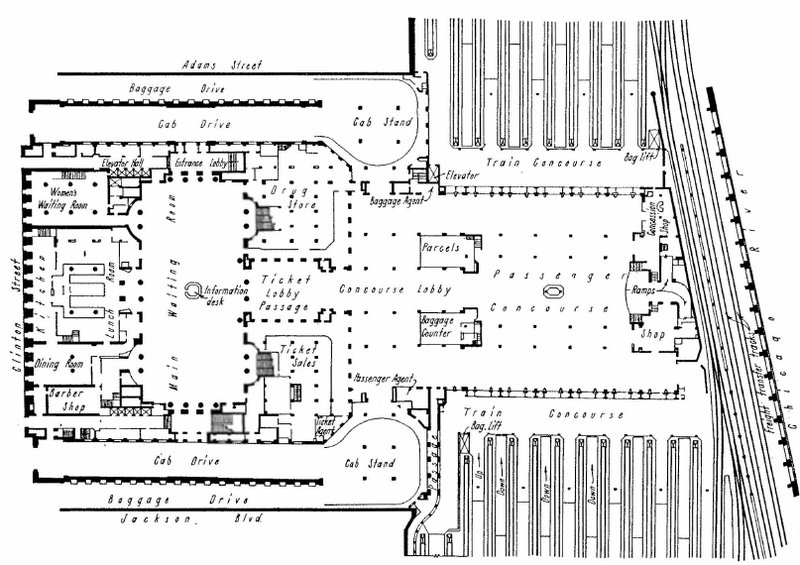 As it was neither practicable nor desirable to locate the entire head house facilities of the station entirely in the space between the two groups of tracks, only the passenger concourse was placed in the block bounded by Canal street, Jackson boulevard, Adams street and the river, the main waiting room and the necessary auxiliary facilities being accommodated in a separate structure the only logical space available for this purpose, namely, the block on the west side of Canal street opposite the concourse, the two units of the station being connected by utilizing the space under the street between the two. In outward appearance the headhouse and concourse are two separate structures of distinctly different outlines. Each occupies a block by itself and is surrounded on four sides by streets. However, the architectural treatment of the two is such as to present a harmonious effect, Bedford limestone being used for the exterior walls of both. The concourse structure is purely a station utility with its exterior outlines determined by the requirements of a spacious and lofty concourse, while the headhouse building has its proportions fixed by the demands of a dual occupancy, that of stat ion facilities in the lower portion and offices above. The site is one that presents an unusually fine setting for a monumental piece of construction. The adoption of a low type of train shed, the construction of viaducts without structural members above the roadway level and the presence of the Chicago river immediately east of the station property afford unusual opportunity to view the head house and concourse from the south, east and north. 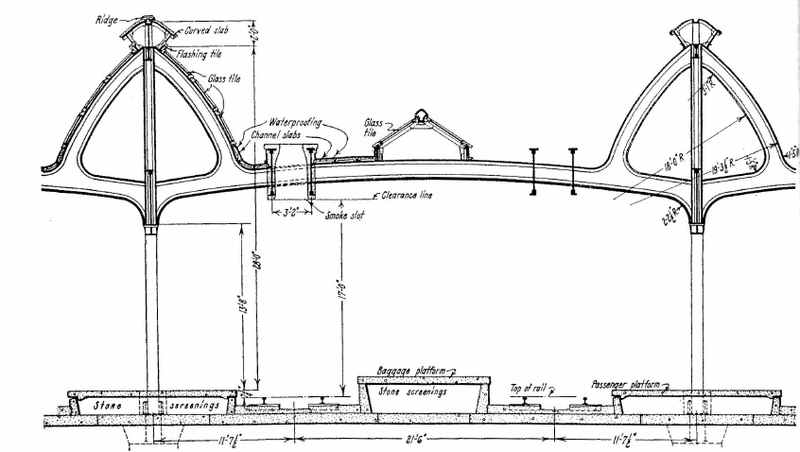 The east elevation has been particularly enhanced by introducing a driveway bet”,een the east face of the concourse structure and the river, connecting Jackson boulevard and Adams street, with its supports along the river side emphasized by an arcade of 16 massive arches, supported on the dock wall along the river to afford an appropriate architectural base, while the parapets or railings of the street viaduct are of sufficient height to conceal the train sheds without interfering with the view of the buildings. The concourse comprises a central mass extending to a height of 108 ft. above the street level, of applied classic outline with its main axis east and west and flanked on the north and south by low wings. The main central portion has a flat gable roof and the east and west faces are treated as ornamental doorways, emphasized by two Roman-Doric columns with Doric pilasters on either side. The entablature above these columns and pilasters is carried entirely around the building at about three-fourths of its height and is surrounded by an attic emphasized on the east and west faces by a segmental arch opening occupied in part by a large clock. Saw-tooth skylights in the gable roof of the main portion are readily discernible abo\e the parapets surmounting the walls, but the parapets of the wings are of sufficient height to conceal their flat-arch roofs. The headhouse structure comprises a hollow square with a central court, the base of which is occupied by the main waiting room. The base of the building occupies the entire block bounded bv Canal, Jackson, Clinton and Adams streets, and has a ·length of 372 ft. north and south by 319 ft. 10 in. east and west. However, the mass of the building above the base, that is, the outline of the office building portion, which has been carried to a heIght of eight stories, is set back 30 ft. 4 in. on the Canal street side, 39 ft. on the Clinton street face and similar amounts on Jackson boulevard and Adams street, giving the effect of a terraced space extending practically to the fourth floor level. On Canal street this is treated as a portico comprising a colonnade of Roman-Doric columns 39 ft. high. Similar treatment is used on Clinton street except that the building wall is flush with the backs of the columns. The treatment on Jackson boulevard and Adams street is more severe and consists primarily of a continuous row of open windows which afford the necessary ventilation for the taxi drivewavs, which will be described later. Architectural emphasis is given to the two entrances to these driveways on the Clinton street corners by ornamental pavilions and for the sake of symmetry similar construction is provided on the two east corners. In order to obtain a clear conception of the station plan it is necessary to have a definite understanding of the arrangement of the street grades in their relation to those of the tracks and to the Chicago river. The level is normally at about Elevation minus 1.0, Chicago city datum, while the streets on both sides of the river are at an elevatIon that averages about plus 15. However, to obtain adequate under clearance the roadways of the rIver brIdges have been raIsed to an elevation ranging from 20 to 26, making It necessary to provide ascending grades on all streets approaching the river bndges. But on the west side of the river the street grades are continued at the hIgher elevatIon to the east side of Canal street to afford adequate overhead clearance for the station tracks. From the east side of Canal street the east and west streets descend to Elevation 15 at Clinton street, one block west, while Canal street has an elevation ranging from plus 22 to plus 26 from Monroe street to Taylor street, with descending grades beyond these limits to meet the normal street. grades at Washington street and Roosevelt road, respectively..
Because the tracks are below the streets and owing to the necessity for dividing the headhouse facilities into two units separated by Canal street, it was necessary and also most desirable to place the main floor of the station below the street level since this affords the operating advantage of having the station on the same level as the tracks and, what was more important, provides a direct connection between the station facilities east and west of Canal street by a connecting concourse under the street. Accordingly, the floor of the passenger concourse east of Canal street was placed at Elevation plus 8, and the floor of the main waiting room in the center of the headhouse west of Canal street at Elevation plus 10, with a scarcely perceptible slope on the floor of the connecting concourse between the two. The baggage room occupies a basement underneath the passenger concourse and the east end of the concourse lobby west of it, at Elevation minus 8.7. With these conditions fixed the interior arrangement was influenced by the all-important requisite of effective and convenient entrances and the maximum simplicity at the entire interior arrangement. Special pains were taken to insure that the routing of the passengers through the station would not only be obvious but would also afford direct access to the various facilities with practically no opportunity for confusion on the part of even the most inexperienced traveler. It is the opinion of the officers of the union station company that the efforts and expenses occurred in developing the plan have been entirely warranted by the operating results obtained since the station has been placed in service. The main waiting room is 100 ft. by 269 ft., back to back of the balconies, at each end, in the exact center of the block bounded by Canal, Clinton and Adams streets and Jackson boulevard. The passenger concourse is 213 ft. long by 192 ft. wide with its longitudinal axis east and west. It is flanked on the north and south by train concourses 36 ft. 9 in. wide abutting on the ends of the statIon platforms. Under Canal street immed iatelv west of the passenger concourse and connected with it oy three broad archways is the concourse lobby, a space 192 ft . north and south by 100 ft. east and west, and continuing west from this on its east and west axis is the ticket lobby passage 90 ft. long by 55 ft. wide, which serves with the central portion of the concourse lobbv as the rnain corridor connecting the waiting room with the concourse lobby and the passenger concourse. The concourse has two main entrances from the street level. 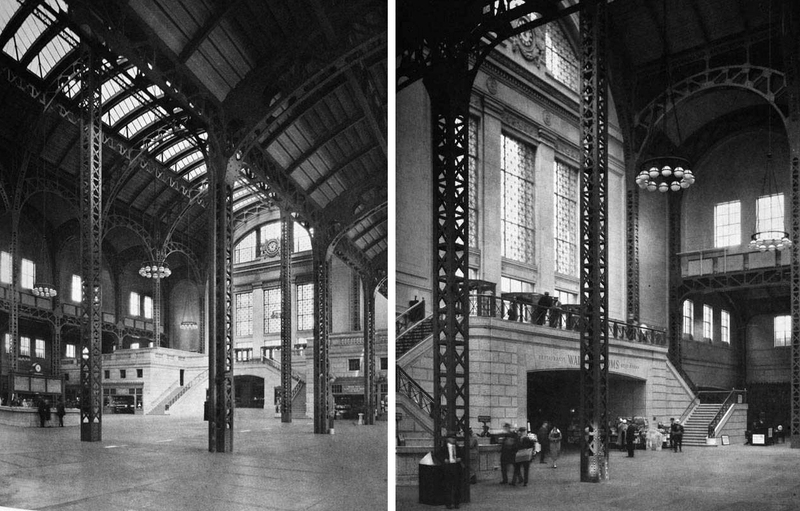 Doorways in the east and west faces fronting on Canal street and the river drive, respectively, communicate with balconies overlooking the interior of the concourse, from which duplicate stairways to the left and right lead to the station floor level. These two entrances are supplemented by two others on Jackson boulevard and Adams street, respectively, near the east end of the building where doorways in two kiosks afford entrance through two ramps descending on moderate grades to the east and west axis of the building where they join at the floor level and emerge into the concourse through a wide archway directly under the balcony of the east stairway entrance. The main entrance to the head house comprises duplicate entrance lobbies 40 ft. wide by 85 ft. long on Cal)al street, 70 ft. 10 in. to either side of the east and west, axis of the building. These lobbies enclose broad stairways which lead directly to the waiting room. But more important than these entrances are the facilities for access by taxicabs, which were developed in a most effective manner by taking advantage of the variation in street grades. With Clinton street at Elevation 15, Canal street at Elevation 26 and the concourse at E levation 8, it was possible to construct two taxi driveways entering the building at the two Clinton street corners with ramps just inside the north and south walls of the building leading to cab stands at the north and south ends of the concourse lobby directly under Canal street at the concourse grade. These taxi ramps may also be used to load and unload passengers at entrance lobbies on the north and south axis of the building that lead directly to the north and south ends of the main waiting room. Arcade entrances are also provided for pedestrians paralleling the taxi ramps and leading from Clinton street to the main waiting room. Each taxi entrance is also used for access to the baggage and express rooms in the basement by means ‘ of a second leg of each ramp extending west outside the first leg and under the sidewalks on Jackson ooulevard and Adams street, respectively, to Clinton street, thence along under the walk on that street to a junction of the two driveways on the east and west axis of the building and thence eastwardly to the baggage and express loading platform in the basement. These drives. have an aggregate length of a half mile, all within the walls of the building and all paved with brick. To insure an effective segregation of the dual functions of the headhouse, that of a passenger station facility and a large office building, special pains were taken to isolate the entrances to the office building portion of the structure entirely from the station facilities. Accordingly, entrances to the offices have been provided in the center of the Jackson boulevard and Adams street sides of the building at a considerable distance from any of the entrances to the station proper. By providing for a flight of six steps from the sidewalk level, access was obtained to loggias with floors at Elevation 23.5, or sufficiently above the level of the inclined drivewavs from Clinton street so that these loggias span the driveways with adequate clearance for the vehicular traffic underneath. These loggias lead to entrance lobbies abutting on the ends of the waiting room but at an elevation of 13 ft. 9 in. above the waiting- room floor level so that they give the general effect of balconies overlooking the waiting room. To the west of these loggias are corridors leading to dllplicate banks of five OtIs elevators each. This number affords adequate service to the office space in the building as now completed to a height of eight stories, but provision has been made for the addition of five more elevators in each group at any time that the height of the bllilding is increased. The auxiliary facilities of the station have been located with a view to the convenience of the patrons, taking into particular consideration the use which the various classes of passengers desire to make of them. The passenger concourse has been kept entirely clear to afford ample unobstructed space for the movement of passengers to and from trains, particularly those using suburban service of the various railroads, who enter and leave via the ramps or the concourse stairways, also outgoing passengers already having tickets, who enter the station in taxicabs and board trains immediately, or arriving passengers who depart at once in taxicabs, or via the concourse exits. The parcel checking stand and the baggage counter are located in the concourse lobby to the north and south of the central passageway, while the ticket lobby is located between the main waiting room and the concourse lobby on the south side of the ticket lobby passage where it is within easy reach of passengers entering the station in taxicabs as well as patrons occupying the waiting room. The other facilities immediately adjacent to the waiting room are those ordinarily required only for passengers who must spend some time in the station. These include a restaurant and supplemental acconunodations for men and women. on the west side of the waiting room. A doorway in the center of the west wall leads to a large lunchroom for quick service while a corridor from the same doorway connects with a smaller dining room for more formal service. North of the entrance to the restaurant is a doorway for entrance into the women’s waiting room, toilets and lavatories, while to the south a doorway opens into a lobby for access to a barber shop and by a stairway to a men’s toilet room in the basement. No provision has been made for a men’s waiting room or a smoking room, studies of large stations throughout the country indicating that the smoking room serves no essential need and is difficult to supervise and maintain in a cleanly condition. As stated previously, the station tracks are arranged in two groups, one to the south of the concourse and the other to the north. The south group, which is used by the trains of the Burlington, the Alton and the Pennsylvania, comprises 14 passenger tracks, while the north group, which is used by the trains of the St. Paul and a few trains of the Pennsylvania, embraces 10 tracks. Just east of the 14 passenger tracks in the south group are 5 tracks which serve the railway mail terminal, a long, narrow building located between Harrison and Van Buren streets. One of these is a through track extending the full length of the passenger tracks and passing to the east of the concourse to a connection with the easterly track of the north station group. The other four are stub tracks, two at the south end and two at the north end of the mail building, the two south tracks connecting into the south approach and the two north tracks into the track. connecting with the north group. This arrangement affords the necessary access to the mail terminal tracks for the handling of mail trains or cars entering or leaving the station via either approach. The passenger tracks in the station have varying lengths so that they are capable of accommodating 7 to 18 car trains, with locomotives. The capacity of the passenger tracks is 191 cars at the south end and 141 cars at the north end. The distinctive feature of the track layout is the provision for a platform on each side of each track, alternate platforms being designed to serve exclusively as baggage and passenger platforms, respectively. The tracks are spaced 23 ft. 3 in. center to center across the passenger platforms, ~hich are 13 ft. 9~ in. wide, and 21 ft. 3 in. across the baggage platforms, which are 10 ft. 7 in. wide. The separation of the passenger and baggage platforms has the advantage that it permits the establishment of independent levels for these platforms at a height most suitable for the particular purpose. The baggage platforms were given a height of 1 ft. 8 in. from the top of rail to afford a reasonable height of baggage trucks constructed with their platforms at car floor level. In the cases of passenger platforms consideration was given to their construction to car floor level, but owing to through car traffic movement involving the. use of cars from various connectmg raIlroads m the west It was found that high platfonns would entail extended changes in equipment by roads that do not use the station. Consequently it was decided to adopt a low passenger platform but with a type of construction that will readily permit of a change to high platfonns whenever it is found desirable. These platforms are now constructed to a height of 7¾ in. above the top of rail with ramps on an ascending grade of 7.12 per cent to connect with the concourse floor level. However, as this floor level is approximately five feet above the track level a future change to car floor level WIll have no other effect than to reduce the grade of the connecting ramps. By far the most advantageous feature of the separation of passenger and baggage platforms is the opportunity it affords for direct access to the baggage room in the basement without the use of elevators, since this arrangement made it possible to introduce ramps at the ends of these platforms descending on a grade of 6.75 per cent to the baggage room floor level. These ramps are 10 ft. 5 in. wide and can be used simultaneously by trains of trucks moving in opposite directions. The main waiting room is a plain rectangle in plan with doorways at each end and at three equally spaced intervals on each side to which architectural emphasis has been given by Corinthian columns and pilasters surmounted by an entablature carried around the four walls at a height of 47 ft. above the floor. The clerestory above this entablature is broken up by segmental arch openings forming vertical continuation of the doorways directly below them. The ceiling comprises a flat barrel vault with its crown 112 ft. above the floor. It consists entirely of skylights with the exception of one row of coffers extending around the sides and the ends. The central doorway in the east wall opens into the ticket lobby or main passageway to the passenger concourse and its coffered barrel vault ceiling, extending to a height of 70 ft. is readily discernible through the clerestory opening- above the doorway. For the sake of symmetry this coffer treatment is repeated in a half dome niche behind the clerestory opening over the central doorway of the west wall. The other six arch openings in the clerestorv serve as windows and are screened by heavy grill work. The floor of the waiting room is Tennessee marble. The walls to the height of the belt course and the shafts of the columns are of Italian travertine. The remainder of the walls and the ceiling are of plaster, finished in a warm buff tint, in keeping with the soft texture of the travertine. The exact center of the waItIng room is occupied by an octagonal information counter with a pedestal in the center affording a support for a four-face clock. The counter and the clock standard are of travernelle fleuris marble. Twenty double benches of American walnut afford a seating capacity of 450. The ticket lobby passage and the two main stairway lobbies on either side of it are also finished with travertine stone with the exception of the ceilings which are of coffered plaster. Similar treatment is used in the north arid south entrance lobbies and in the office building entrance lobbies directly above them. The stairways from Canal street do not occupy the entire width of the stair lobbies but afford space on either side for balconies 8½ ft. wide at the street level to permit access to concession spaces reserved for shops. The toilet room for men in the basement of the southwest corner of the building- also provides free and pay service. The free toilets contain 38 closets, 18 urinals, 16 lavatories and one Bradley wash fountain. The pay toilets provide 26 closet lavatories, fom of which are supplemented by shower baths. All of the toilet rooms have Tennessee marble walls and floors and plastered ceiling. Standard Sanitary Manufacturing Company’s fixtures were used throughout. The barber shop, which opens off the stair lobby to the men’s toilets, is a room of unusual decorative treatment. The floor is Welsh quarry tile set with wide joints while a high wainscot is finished Faience tile having a buff body and green trim with recesses for toilet cabinets and open shelves. The ceiling and the walls above the wainscot. are plastered with a smooth but irregular surface tinted in light cream. Space is provided for 16 barber chairs, with individual pedestal lavatories and mlrrors wlth black frames for each chair. The largest room on the west side of the building is a lunch room 85 ft. by 111 ft., located symmetrically with respect to the east and west side of the building. It has a low American walnut wainscot with a marble base. plastered walls and a coffered ceiling. The entire west side of this room for a width of 22 ft. 8 in. 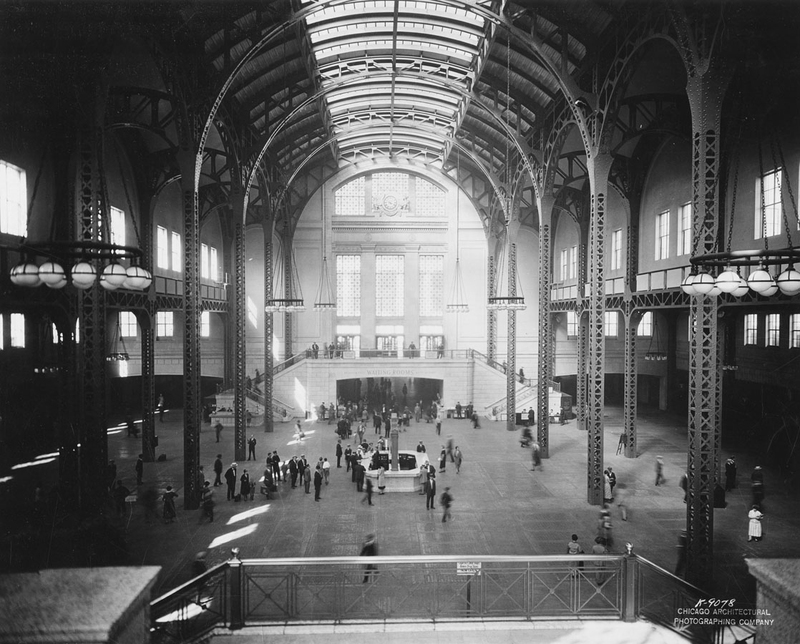 and a height of 13 ft. is occupied by a service kitchen, the remaining floor space being occupied primarily by three U-shaped lunch counters with space adjacent to the north and south walls and on the mezzanine floor above the kitchen occupied by tables. The counter and stools are of table-chair height. The top of the counter is a thick slab of green Vermont marble while the base is of grey travernelle on the patrons’ side and Tennessee marble on the serving side. The floor on the public side is Tennessee marble, and on the service side it is rubber tile, the service space floor being depressed a sufficient amount below the level of the public space floor to give the counter a convenient serving height. To the south of the lunch room is a formal service dining room, 42 ft. 5 in. by 56 ft., which is decorated in a more subdued tone than the other rooms. It has a high wainscot of American walnut divided into small panels to offset the effect of the high ceiling. The walls are plastered and the ceiling is coffered in decorative plaster. Unusual pains have been taken by the concessionaire to give the room a dignified, distinguished air. Unusually rich furnishings have been provided in the form of tables, chairs and sideboards of antique Italian pattern. Access to this room is afforded by a corridor from the main waiting room as weI! as by a short corridor leading to the Clinton street entrance of the south arcade. This dining room and the lunch room receive direct service from the service kitchen at the rear of the lunchroom, but the main kitchen, bakeries, stores, dish washing facilities, refrigetators, etc., are in the basement. The basement space assigned to the concessionnaire, Fred Harvey, also embodies a large cafeteria, entrance to which is had by a stairway leading from the south lobby of the waiting room. All kitchen space in the basement is finished with red quarry tile floors and white glazed tile walls. The ticket lobby occupies the entire southeast corner of the headhouse east of the main waiting room and south of the ticket lobby passage. Of this space a rectangular area 58 ft. by 100 ft. is occupied by the ticket offices, affording 150 ft. of counter length on two sides with 29 ticket windows. The face of the counter is travertine, the top is Belgian black marble and is surmounted by a brass gril! backed with clear glass, thus affording a clear view of the entire interior. There are no fixed ticket cases. Each ticket clerk is assigned an individual case mounted on castors which is rolled into place adjacent to his window when he goes on duty and is locked up and removed to permit its replacement by a case assigned to the clerk who relieves him when his tour of duty is completed. The only segregation of the business done at the various ticket windows is to assign six windows to the sale of commutation and local tickets and assign all the rest of the windows to the sale of both railroad and sleeping car tickets. Each clerk is equipped to sell tickets for all roads using the station, his ticket case being stocked with tickets covering 95 per cent of the routes called for in the normal ticket sales. Tickets covering the remaining routes are kept in a special case placed in the center of the ticket office where they are available to all clerks. The clerks are provided with telephones for communication with the reservation bureau on the third floor where clerks in the employ of the four railroads record reservations on the car diagrams. 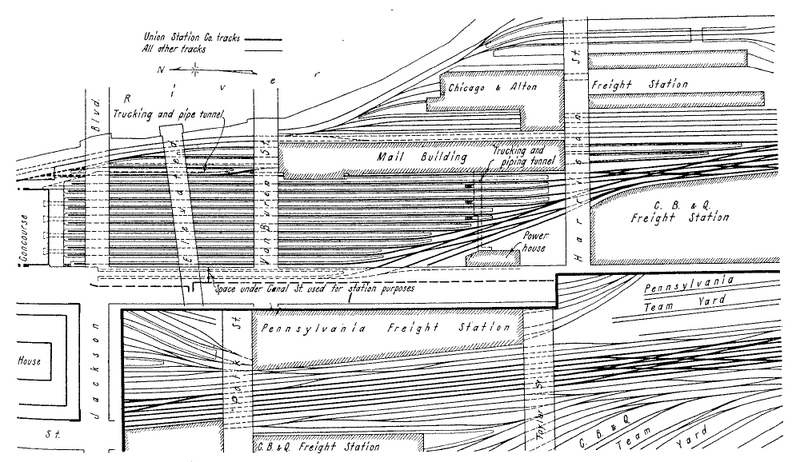 A few minutes before train leaving time, the diagrams are transmitted by pneumatic tube to the passenger agents of the individual railroads who occupy offices at the south end of the concourse lobby, whence they are delivered to the Pullman conductors. Space is also provided on the third floor for an information bureau. In this room 20 trunk lines from a Chicago telephone exchange are carried to 12 operator positions, 6 on each side of a long table, divided lengthwise by a rack equipped with time tables and rate sheets for ready reference. Each operator can handle a call coming in on any trunk moving the proper keys. The.concourse lobby under Canal street has a Terrazzo floor, terdcotta walls and a flat groined ceiling finished in light grey. The baggage and parcel counters are constructed of laminated maple and steel plates with vertical sliding windows of rough wire glass set in steel frames. 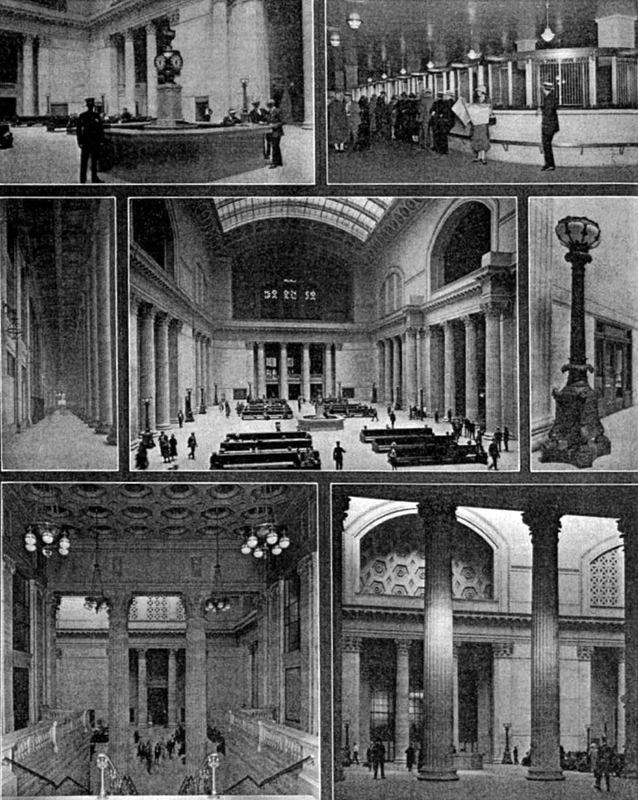 The interior of the passenger concourse is of a design somewhat similar to the concourse of the Pennsylvania station in New York, except that opportunities were afforded for a greater refinement of detail in the Chicago station. The roof consists of five flat barrel vaults with station. The roof consists of five flat barrel vaults with their axes east and west and is supported by steel arches carried on steel columns, all of the steel work being entirely exposed. The framing of the main central portion of the structure is divided into three longitudinal aisles with a central span of 84 ft. and two side spans of 20 ft., the ceiling at the crown of the central span being 90 ft ahove the floor and that of the two side spans somewhat lower. Flanking this central portion are two side aisles of 68 ft. span with ceilings 43 ft. above the floor. In the transverse direction the ceiling is .divided into bays 34 ft wide which are spanned hy longitudinal arches. The arches are a ll open box tru sses and the columns comprise four angles laced on the inside, the framing being done in an unusually finished manner, especially at the junction of the four arch trusses at the tops of the main columns. The roof is covered for the most part with Federal pre-cast cement tile. In the main center span and in the two low side aisles these tile are exposed on the under side, while in the two 20-ft. aisles a plastered ceiling of flat dome shape has been provided. The waUs for the most part are grey mottled terra cotta with some of the upper portions of plaster finished in imitation of stone. The windows have steel frames and sash. The floor is of reinforced concrete with large areas of vault lights for the purpose of affording some natural light to the baggage room in the basement. The floor of the concourse is entirely unoccupied except for an information counter of terra cotta in the center, over which is mounted a train bulletin divided into panels assigned to the various railroads. This bulletin board is surmounted by a two-face clock. At the east end of the building, flanking the stairway are two low projections from the east wall, the lower portions of which are devoted to concession space occupied by Fred Harvey as a grill room, a fountain luncheonette and a cigar, magazine and book shop. Access to the train concourses ‘ on either ‘side of the passenger concourse is provided by continuous lines of vestibules 7 ft. 3 in.. deep with sliding ‘ doors on the inside and swinging doors on the track side. These vestibules are arranged in groups serving two tracks for each 34 ft bay, providing two exits to the trains 4 ft. 8 in. wide next to the columns with an entrance from the trains in the center 12 ft. wide. A “Hutchinson” train indicator for each track separates the entrance and exit doors. The vestibule construction is entirely of iron and steel with glass panels in the doors set in steel frames. The train concourses, which correspond in detail and construction with the passenger concourse, are entirely open on the track side except for iron railings at the ends of the tracks which are carried partway down the sides of the passenger platform ramps. A pneumatic tube system comprises an important agency in the operatIon of the baggage room. This affords direct connection between weighing stations at the loading platform and the exchang:e cashier’s office, which is located in the baggage room directly below the checking counter enclosure on the station floor, between the exchange cashier and the checking counter and between the exchange cashier and the baggage master’s clerks office. Every piece of outbound baggage unloaded at the platform is weighed by a receiving clerk on one of three automatic scales who makes out a weighing slip on which he records the weight and the number and name of the trucking company’s check on the trunk. This weight slip is transmitted to the baggage counter for file until the passenger presents his duplicate check. When the duplicate of the trucking company’s check is presented at the counter, it is taken up and dispatched t.o the exchange cashier with the duplicate of the railroad check presented to the passenger for identifying the trunk and attaching the new check. Hand baggage checked at the counter is passed to the baggage room by means of a chute, while incoming hand baggage is delivered to the counter by an elevator and placed on compartment shelves until called for. The efficiency of this detail of the service is indicated by the fact that cases have been noted where hand baggage has been loaded out of baggage cars, trucked into the baggage room, elevated to the counter enclosure and stored before a passenger could alight from his train and walk the length of the platform and concourse to claim his baggage at the counter. While natural lighting has been provided in abundance in the principal rooms of the station, careful study was given to insure that the artificial illumination would be equally effective. The lighting of the main waiting room is unique and embraces two independent systems. The ceiling and clerestory walls are lighted by two batteries of flood lights installed in balconies at the two ends of the room. Each bank contains thirty-five 500-watt X-ray reflectors and produces a well diffused light. The lower portion of the walls, the columns and cornices of the belt course are effectively lighted by lamps installed on the tops of 16 massive bronze torcheres or floor standards mounted on green Vermont marble bases and placed at uniform intervals along the walls. The lighting fixture is a glass bowl ribbed with bronze which contains two 2S0-watt lamps mounted over a mirror reflector with four lOO-watt lamps below the reflector to illuminate the sides of the bowl. The coffered vault of the ticket lobby passage is lighted by twenty-four 2S0-watt X-ray projectors on top of the cornice along the two sides of the room, while the walls are illuminated by four bronze brackets secured to the walls about 14 ft. above the floor. The dining rooms and the women’s rest room are lighted by ceiling fixtures of artistic design, while the concourse lobby is lighted by simple bowls in the center of each panel of the groined ceiling. In the passenger concourse the lighting fixtures are a simple rugged design in distinct keeping with the open steel work which supports the roof. They consist of 12 opal glass spherical globes suspended from a tubular steel ring supported by chains from the roof trusses, being provided with lowering devices to facilitate cleaning. The passenger platforms are provided with two sOO-watt lighting fixtures in each longitudinal panel. As no standard lighting unit was found to give a satisfactory distribution of the light, a special fixture furnished by the A. B. Boetter Manufacturing Company was designed for the installation. It consists of casting of special corrosion resisting metal with a polished interior to serve as a reflector with an acorn shaped rippled glass globe. The baggage platforms are lighted with standard R. L. M. reflectors fitted with clear glass covers. Street lighting has been provided in the form of 40 ornamental street lighting standards each supporting two G. E. “Novalex” basket type street lighting units with 600 candle power series lamps. The balustrade along the river drive is ornamented with stone pylons each of which is equipped with four lOO-cartdlepower series lamps while the office building entrances on Jackson Boulevard and Adams street are embellished by heavy bronze lighting standards of rugged design. One of the outstanding features in the design of the station is a new type of train shed which represents a development resulting from the unusual conditions imposed by the arrangement of the platforms and a sincere effort to effect an improvement over previous designs. It was desired to provide a low type of shed and because the open umbrella or butter fly sheds do not afford complete protection against rain or snow it was concluded that the shed must be of the enclosed type with smoke slots just clearing the locomotive stacks to obtain an immediate discharge of smoke into the open air. It was also felt desirable to provide more headroom over the passenger platforms than is usually obtained in low sheds. Another controlling consideration in the determination of the design was the width of the baggage platforms which is not sufficient to pt!rmit the placing of any columns in them. Consequently, the design had to be one in which the transverse roof span equals the distance between columns placed in the centers of the passenger platforms, or 49 ft. 9 In., a condition that at once introduced a serious problem to avoid excessively heavy and deep transverse girders to support the roof load. These problems were solved by the development of a design which is not only ingenious from the standpoint of the structural engineer but is also unusually pleasing in appearance. The transverse load-carrying member comprises a flat arch girder affording a clearance of 17 ft. from top of rail, combined with two upward extending legs which are carried to a connection at the column at a height of 28 ft. above the platform. This arrangement provides a heart-shaped truss over each column which performs two important functions. It provides a monitor over the passenger platform affording the desired headroom, more effective lighting and better ventilation, and it effects a marked shortening of the effective span of the transverse girders. For the purpose of reducing the obstruction in the passenger platform resulting from the presence of the shed columns, they were spaced as far apart as practical considerations would permit, 41 ft . 8 in. center to center. The load between the transverse frames is carried very largely on the longitudinal g irders forming the sides of the smoke slots, but supplemented by arch girders in the planes of the columns which frame into two struts connecting with the tops of the columns to form a ridge pole for the monitors over the passenger platforms. These longitudinal members support five equally spaced rafters conforming to the contour of the roof outline to provide the primary support for the roof covering. Particular commendation must be made of the manner in which the detailing and fabrication of the train shed frames were carried out. The frames have an exceptionally neat, graceful and finished appearance, one means to this end being the use of special sections of bulb beams for the curved rafters No less distinctive than the outline and framing of the shed is the roof covering which consists of Federal cement tile throughout, for the profile of the roof cross section is such as to call for the exercise of ingenuity as well as accurate workmanship to provide precast tile that would insure a perfect fit to the curves and angles of the steel frame. It imposed the necessity of providing 11 varieties of tile units fo r the standard portion of the shed and special units used in the portion of the shed near the outer ends where it conforms to the curves of the converging tracks and where the sheds adjoin the street viaducts. Over each baggage platform is a gable type skylight covered with interlocking tile 1¼ in. thick, 24 in. wide and 52 in. long on each slope with a standard ridge cap at the ridge. Each third interlocking tile on both slopes is provided with a pane of glass 21 in. by 35 in. The remaining portion of the shed roof, namely, between the baggage platform skylights and the lower edge of the passenger monitor skylight~ exclusive of the smoke slot is covered wIth channel-= sectIon slabs approxImately 18 inches wide by 8 ft. long. In addition to these units flashing tile are provided under the edges of the baggage skylight and under the hood over the passenger monitor. The channel slabs form gutters which provide the drainage for the roof, emptying into down spouts at the low end of each block. The gutters are provided with Johns-Manville built-up roofing which is flashed up under the skylight and up the sides of the smoke slots. All the rest of the tile are uncovered, as water proof construction is insured by overlapping horizontal joints and filled vertical joints, together with the density of the concrete in the slabs themselves . The plastic joints are formed by projecting lips on the vertical edges of the slabs, so shaped as to provide a groove which is filled with a special oil-cement filler covered with a weather coating of elastic compound. The glass tiles are of particular interest because the glass is concreted into the slabs in manufacture and is protected against st resses set up by changes in temperature, wind pressure and other strains by dipping the edges of the glass in a hot asphalt preparation before inserting it into the concrete. Another difficulty imposed in the construction of the train sheds was introduced in the provision for a covering for the girders of the smoke slots to protect them from the corrosive locomotive gasses. Poured-in-place concrete was used for this purpose, the particular problem being to insure a high density in a concrete of such consistency that it would readily flow around the reinforcement and in an exceedingly narrow space between the forms and the sides of the girders. To obtain this the mixture was designed according to the Abrams method. The work on the station building was started in 1919 with the excavation of the site and the sinking of caisson foundations and the construction of retaining walls on the site of the headhouse. It was originally planned that the headhouse would comprise a structure used only for station purposes, its height being limited to that required for a waiting room with a high ceiling. The foundations for a structure so designed required 268 caissons containing 13,600 cu. yd. of concrete. However, shortly after this foundation work had been completed it was concluded that the air rights on the site occupied hy this structure were so valuable that it would be unwise to construct a building which would not permit of their full development. Accordingly, it was decided to construct a building which would not only house the main waiting room and auxiliary facilities but would serve also as an office building, with an ultimate height of 22 stories. This decision at once introduced a serious problem because the loads to be imposed by a 22 story building were so much greater than those of the structure for which the foundations had been constructed that the piers already in place were entirely inadequate to carry the taller structure. A further complication was introduced by the fact that the new design of building embodied an extensive relocation of columns so that the position of many of the columns did not correspond to the location of the foundation piers. Under these circumstances an extensive reinforcement of the foundation was imperative. Before undertaking this, careful consideration was given to the possibility of applying greater loads to the piers already in place than those for which they had been designed on the basis of the unit bearing pressure allowed by the building department of the city of Chicago for caissons supported on hardpan, namely six tons per square foot. This led to the construction and loading of an experimental caisson four feet in diameter by 71 ft. deep which had the support removed from beneath its bottom by digging a tunnel from a shaft sunk nearby so that the loads imposed on its top were supported entirely by the skin friction of the sides. The test made on this caisson showed that no movement occurred under loads producing a skin friction of 350 tons per sq. ft. of cylindrical surface and on the basis of these findings the city building commissioner authorized the increase in the allowable load on the caissons to 10 tons per sq. ft. The exact manner of making this testis explained in an article in the Railway Age for March 11, 1922, page 561. However, in spite of this concession the work of strengthening the foundation was both difficult and expensive. It required the sinking of 192 additional piers from 4 to 10 ft. in diameter, some of them so close to the old ones as to introduce serious complications in excavation. In addition a large number of reinforced concrete girders had to be constructed to span across two or more of the piers for the support of columns in new locations. In such cases cantilever construction had to be resorted to as a means of relieving some of the old piers of a portion of the load applied. This work was followed by the erection of the superstructure of the headhouse and the completion of the Canal street structure, after which work proceeded on the excavation and foundation work for the concourse. To permit the concourse work to proceed it was necessary to provide a temporary passageway for the passengers between the old station and trains entering the station from the south, which at this time were using the new south group tracks. This arrangement, which entailed a walk of about one block from the station to the head of the passenger tracks, was probably the most serious inconvenience to which passengers were subjected as a consequence of the construction operations. Practically no delays to trains were attributable to the construction work, in fact, after the old freight stations had been removed there were more tracks available for passenger station use than were embraced in the old station facilities. As soon as the roof, walls and a portion of the floor of the new concourse were completed the passengers were provided with a passageway through this structure to the south train sheds. With the opening of the new station on May 15, opportunity was afforded for the wrecking of the old station and the excavation of the site for the construction of the tracks, platforms and trainsheds in the north group, upon which work could not proceed until the old station is removed. This work is now in progress. With this exception, the framework of the new train sheds is all in place and the concrete tile roof and skylights are being erected, temporary umbrella sheds being removed as fast as the new roof is completed. The removal of the old station also makes it possible to proceed with the work of raising Canal street to the new level and widening it to 100 ft. in the block between Monroe street and Adams street, the only portion of the improvement of Canal street which has not been completed. All of the various viaducts across the tracks are now complete with the exception of Adams street, upon which work will be undertaken shortly in connection with the construction of a new bridge across the Chicago river by the city. The conduct of these additional items of construction work will, however, result in little interference in the operation of the station. 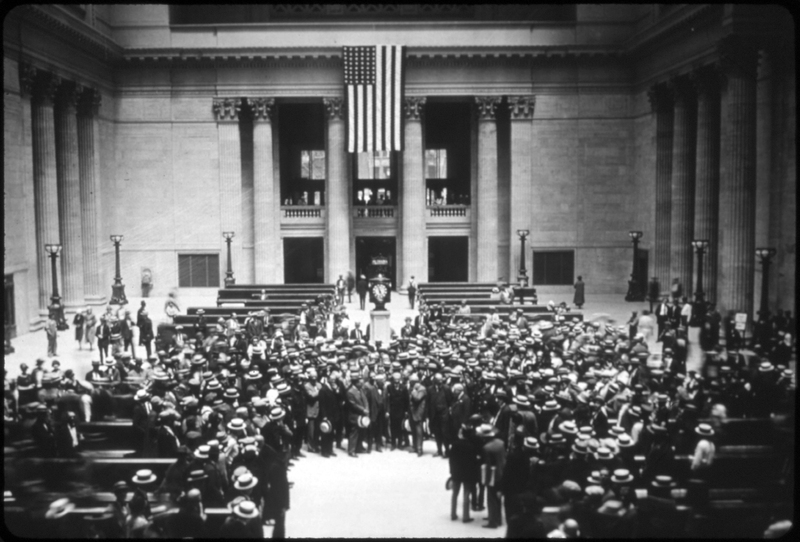 Organization During the course of negotiations with the city of Chicago in 1913, the Chicago Union Station Company was organized and J. J . Turner, first vice-president, Pennsylvania Lines West, was elected president. Thomas Rodd, chief engineer of the Pennsylvania Lines West, was also made chief engineer of the Chicago Union Station Company, with Joshua D’Esposito as assistant chief engineer in direct charge at Chicago. Graham, Anderson, Probst and White, Chicago, were retained as architects. In addition, an advisory board of engineers was organized which consisted of the chief engineers of the proprietary railroads, this board remaining in active service during the entire construction period. In 1919, upon the retirement of Thomas Rodd from active railway service and his appointment as consulting engineer, Mr. D’Esposito was made chief engineer. The staff, which assisted him in the design of the various facilities and the conduct of the work included A. J . Hammond; principal assistant engineer, who resigned in October, 1922, and was succeeded by E. E. Stetson; E. Weidemann, engineer of buildings and structures; A. S, Holmes, assistant to the chief engineer; C. E. Cox, engineer of contracts and estimates; C. J. Noland, office engineer ; E. Brock, mechanical engineer; Thomas Holt, signal engineer; C. W. Post, electrical engineer, and C. L. Swanson, chief clerk. Following the retirement of Mr. Turner in 1922, Samuel Rea was elected president of the Union Station Company. The principal construction contractors on the project were as follows: John Griffiths & Son Company, general contractors for the headhouse and concourse; R. C. Wieboldt Company, general contractors for the mail building and foundation and steel erection contractors on the headhouse; W. J. Newman Company, contractors on. excavation, wrecking, sewer construction and concrete track slab construction; Robert Gordon, Inc. , heating and ventilating ; O’Callaghan Brothers, plumbing; A. E. Coleman Company, ornamental iron work; Edward Moore Roofing Company, roofing; McNulty Brothers Company, plastering ; Alfred Olson Company, painting ; Hatfield, Electric Company, electrical installation; Kel1y-Atkinson Construction Company, Ketler Elliott Construction Company and Overland Construction Company, structural steel erection ; and the Underground Construction Company, foundation work. It is unfortunate that the train sheds had to be destroyed to build a concrete monolith over the tracks.